I’m halfway to Jupiter status! The race went very well and the best part is I don’t even feel like I ran a half marathon two days ago. I found a friend who was up for taking a road trip so I didn’t end up having to do any driving. 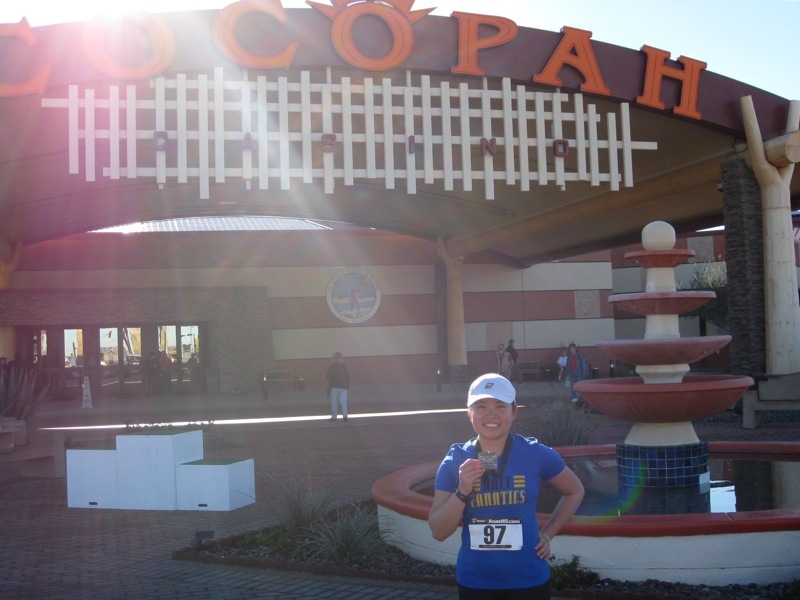 We left Friday night and made it to Cocopah Resort, the host hotel, about 10 minutes before packet pick-up closed. (I could have picked up my packet in the morning too, but it was nice to get everything taken care of that night.) Notable items from the goody bag were a couple Hammer Nutrition products and a pedometer. In terms of convenience, I think this is the best race I’ve done. 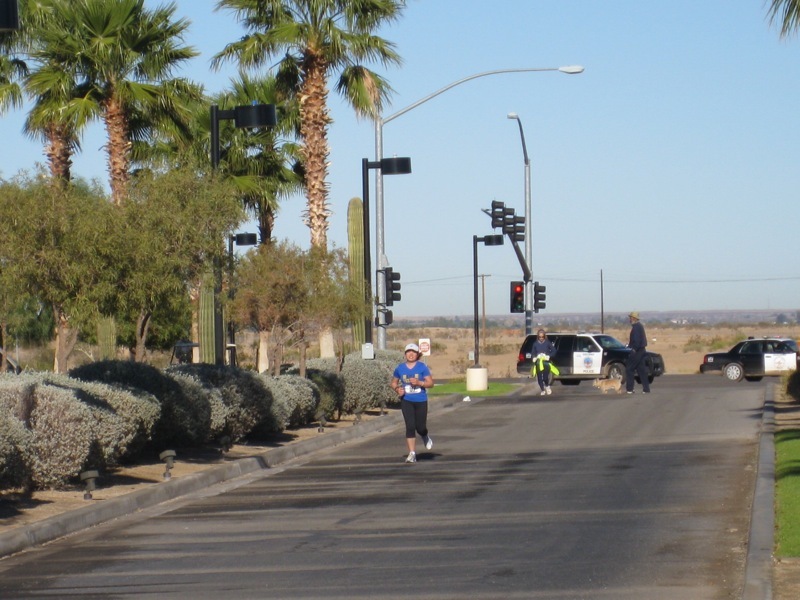 The start/finish line was outside the Cocopah Casino, which was literally next door to the hotel. It was maybe a three minute walk from the hotel room. I picked up my timing chip, did a tiny bit of warm-up and stretching, and slipped into the casino for one last bathroom stop. The race started at 7:20am. A few minutes before, we all gathered in the corral and after a five-four-three-two-one countdown we took off. As you can see, it was still dark when we started, but it didn’t take long for the sun to come up. The course was an out-and-back. I thought it was too bad we were running west for the first half because it would have been neat to watch the sunrise. I was wearing pretty much the same outfit as I did for Rock ‘n’ Roll AZ last week. 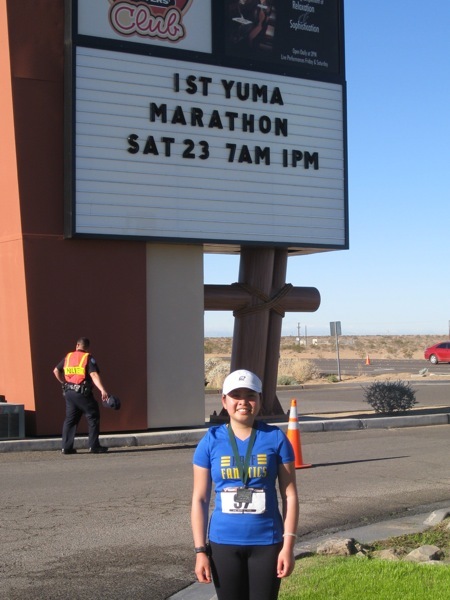 Unfortunately I didn’t take into account that this race was starting almost two hours earlier than RnR AZ. I warmed up a little once I started running, but I really wished I had kept my gloves on instead of leaving them with my friend. My hands were cold through almost the entire race. At one point I stopped because I had a rock in my shoe and my fingers were so stiff that a volunteer ended up helping me retie my shoelace. 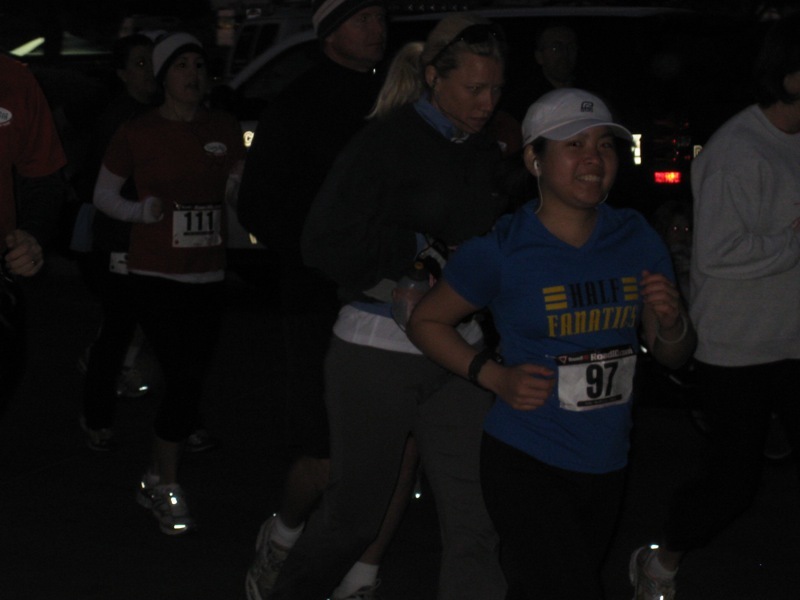 Other than the cold, everything about the race went really well. I went with run .9 mile/walk .1 mile intervals. Mentally it definitely helped knowing that I had a walk break coming up, versus trying to run the entire thing. The only time I broke from the .9/.1 pattern was near the very end where there was a fairly significant hill in the middle of mile 12. I also took a longer walk break during mile 13 because at that point I knew I’d finish under 2:30 and didn’t feel the need to push myself considering that I have two more halves in the next two weeks. I started running again when I could see the finish line in the distance. My official time was 2:27:58, an 11:18 pace. 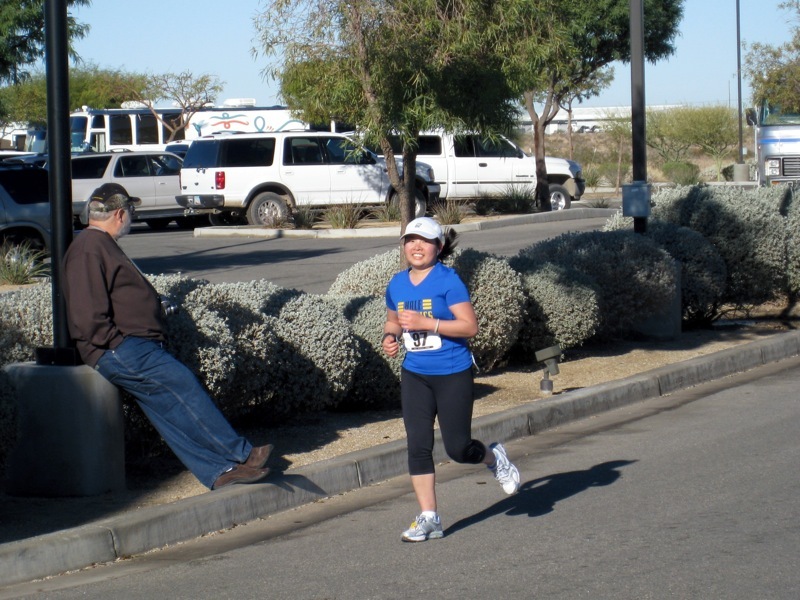 Surprisingly I felt really good as I finished. My calves were a little tender, but overall my legs were in much better shape than after last weekend. Not that I was trying to go hard or fast, but I expected to feel worse just by virtue of having covered 13.1 miles on foot. After grabbing a bagel and some fresh fruit, I made my friend take a few photos of me with my new medal. We also checked out the awards which were pretty cool. 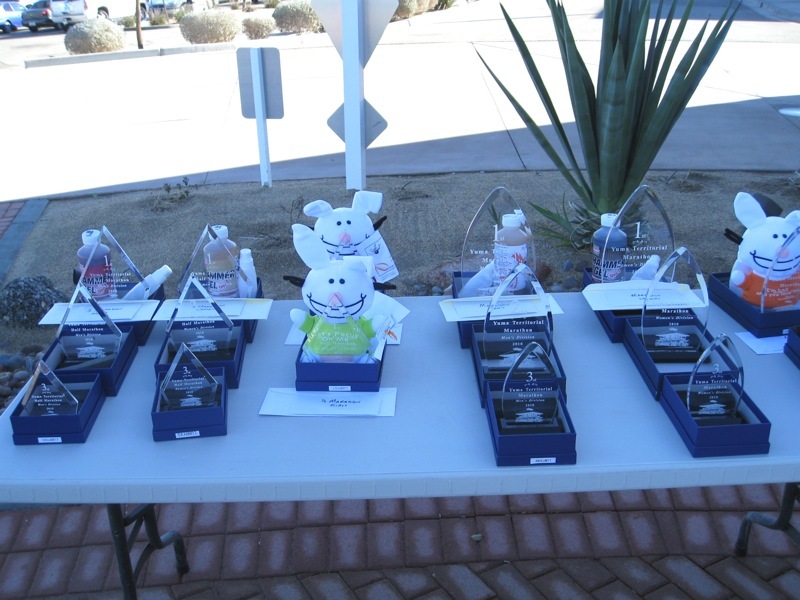 Since it was a small, inaugural race there were no age group rankings, just the overall winners. 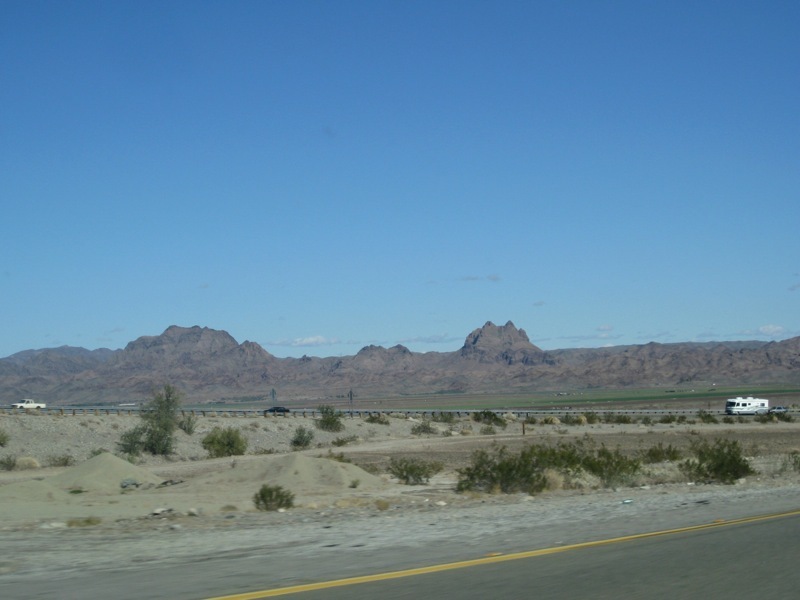 The pretty desert landscape… I’m going to miss seeing views like this when I get to Baltimore. 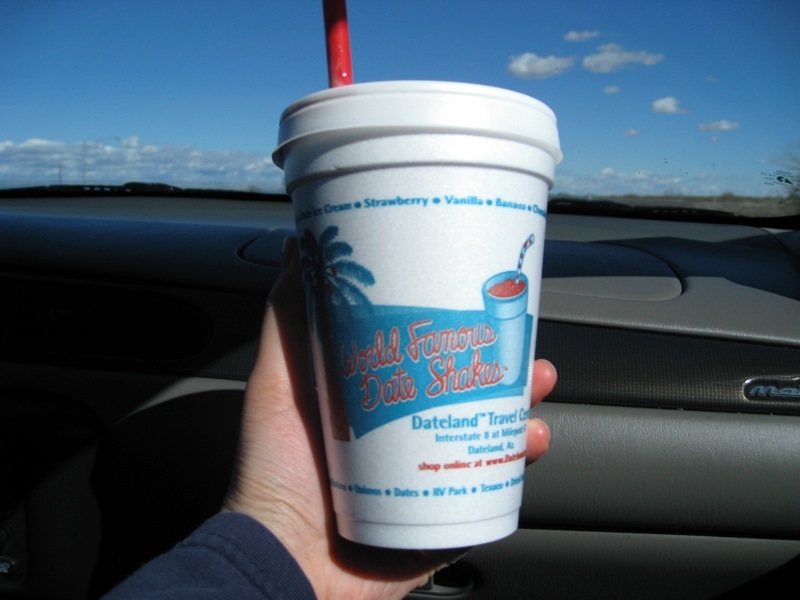 We stumbled upon Dateland, AZ entirely by accident when we stopped for gas. They had all sorts of products made from dates, and I couldn’t pass up the opportunity to try a “world famous” date shake. It was quite yummy! 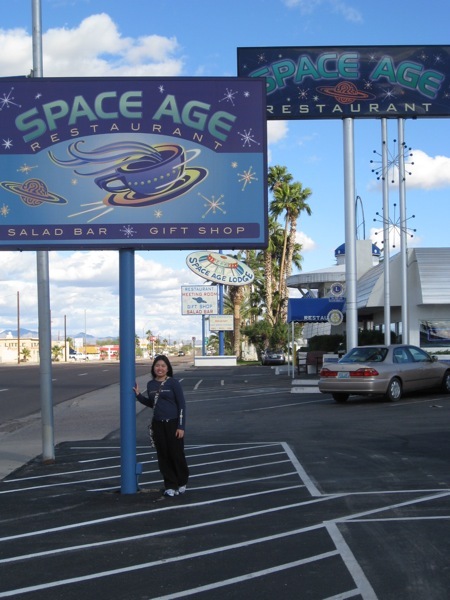 We saw the Space Age Lodge & Restaurant in Gila Bend, AZ on the way down and decided to stop by for lunch on the way back. The food was okay, but the real highlight of the place is the theming, including large hand-painted murals on the walls of the restaurant and hotel lobby. Previous postFanatical or just plain crazy? Congrats on a great race!!!! congrats on the race, and so soon after rnr! loved all the pics. i need to get out and see arizona! !